If you are a City College sports fan you may have already viewed the Rams Women’s and Men’s basketball games lived streamed at City College Rams Facebook page. If not don’t be too hard on yourself, the BEMA department is here with plans to live stream not just next year’s basketball games but also City College football and possibly other sports here on campus. Professor of Media Arts Misha Antonich is the producer with media students who volunteer to run cameras and to take care of other technical duties. Calling the play by play is Aaron Turner with Color Commentator Matias Godinez. Rams finish runner up in second consecutive state title. 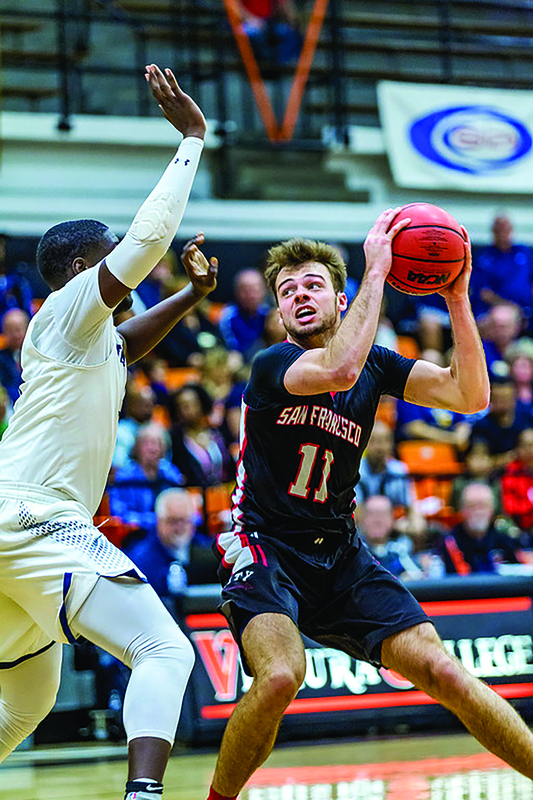 The City College Rams Men’s basketball team lost 85-79 to the Orange County Fullerton College Hornets in the CCCAA Mens State Championship game held over the weekend in Ventura. 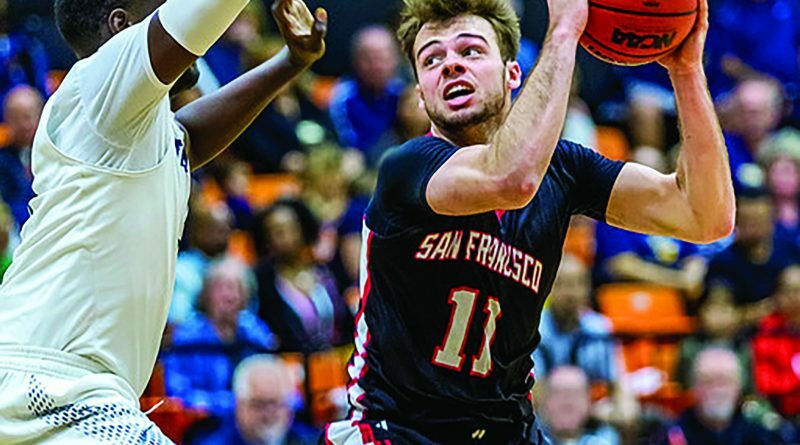 It was a disappointing finish to an already difficult weekend for the Rams who narrowly won against the Santa Monica Corsairs 67-63 in the Northern California Regional semifinals. The Rams then made it to the final four on Saturday, where they pulled off a 87-82 comeback overtime win over Citrus College Owls, putting them into the State Championship game for the second consecutive year. The Rams got behind on Sunday’s championship matchup against the Fullerton Hornets, trailing by six at the half. It was much tighter game in the second half as the Rams seemed to have gotten back their composure. They rallied from behind, something the Rams have done throughout the season, the only problem with this game is that the rally came too little, too late. Sophmore Austin McCullough#11, post up against Fullerton COllege at the State Title game on Feb. 167, 2019 in Ventura, Calif.. Photo By Eric Sun/Special to the Guardsman. At the beginning of the second half the Rams were looking like they were back in the game making crucial points and playing smart, but they just couldn’t get the ball into the basket. The two top seed teams played a fairly physical game which the referees expected as they were blowing whistles for infractions big and small. Fullerton capitalized from the line successfully making 78 percent of their free throws, which amounted to 36 points. While the Rams only completed 61 percent, totaling 19 points. Dale Currie was the Rams leading scorer with 21 points to his credit while NorCal Co-Conference player Malcolm Johnson had a double-double with 11 rebounds and 13 points. As the game clock ticked down to the final minutes of the game it became clear that the Rams goal of back to back championships was going to fail. When all was said and done City College had a great season, with an impressive overall 31-2 record, continuing their tradition of a championship program.